Vivian Lee is the grand old man of Guyanese entertainment. As a creative entrepreneur Lee has been involved in television, promoting stage shows, advertisement, songwriting and radio as early as the late 1940’s. He owned a record shop and ran the Ace Records label based in the capital of Georgetown. 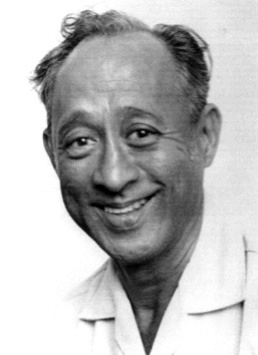 Lee was also a master on the soccer field and played for the Guyanese National Team. Even though Lee, born in 1919, wasn’t the first Guyanese in the record business he left his mark on many parts of national culture. Singer Johnny Braff, who also had some success away from home, was the main artist on Ace Records. 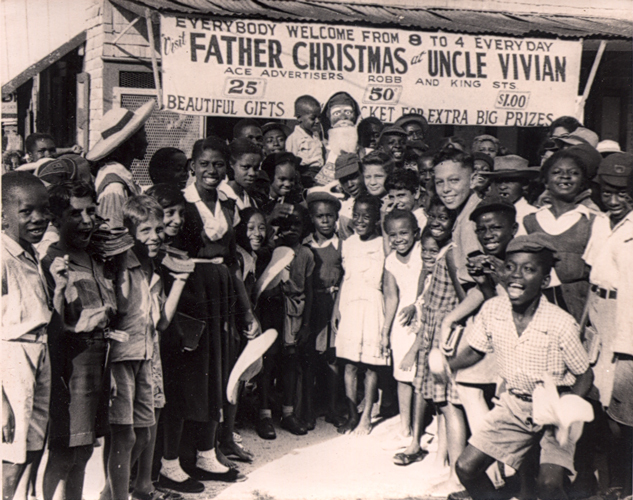 In 1966, Guyana obtained independence from Britain and as any experienced producer would do, Vivian Lee released a Johnny Braff album with the celebratory songs. Ace Records released around 50 titles spread out between 78’s, 45’s and albums. He’s still going strong. At the age of 75 Mr. Vivian Lee received a Bachelor degree in English from University of British Columbia, Canada. Can you please tell me about yourself and how you got into music? I was born August 27th, 1919 in Georgetown, Guyana. My parents didn’t play music but as a kid growing up I was interested in the English language. I used to write poems. My song writing started as a hobby. 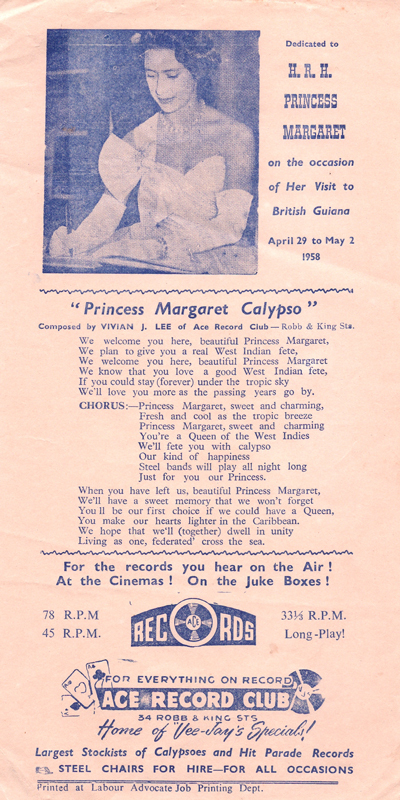 I wrote the welcome song for (British Royal) Princess Margaret’s visit to Guyana in 1958. It was sung by Lord Canary. I also introduced the first steel band costume contest in 1955. I never played in any bands myself though. You had your advertisement agency before your record label, right? I already had my advertisement agency when I opened up my record shop in probably the late 1950’s. I saw an opportunity to sell records, went ahead and got myself involved in the record industry. My advertisement agency was called Ace Advertisers and since the name denotes top quality it made sense to call the record label the same. At that time there was only one other label. It was called GEMS Caribbean Carnival. What can you tell me about Johnny Braff? He seems to be one of the most popular singers to come out of Guyana during your time. I met Johnny while I was scouring for talents for my Vaudeville (TV) shows. His real name is John Brathwaite and I made him change it to Johnny Braff. His voice struck me and I saw its potential. I took him to NY where he gained more popularity and he stayed. What did the record industry look like in Guyana back then? There were no local pressing plants. I had my records pressed up by Decca in London. I can’t remember the exact number of releases I had on my label but it must have been around 50. The Mighty Sparrow made his first recording of a very popular song called “Jean and Dianah” with me when he visited Guyana in the 1950’s. Looking back it was sort of careless on my part not to keep a discography of my releases. I took care of the distribution locally with the help of my 2 or 3 employees. I also sold records in Barbados and Trinidad & Tobago as well in some parts of the US after the success with Johnny Braff. All Ace songs were recorded in Georgetown. Most of the time I used Radio Demerara’ studios. In the end I decided to leave the music business because it wasn’t profitable. Regarding the mastertapes then some of them are poorly archived in the Radio Demerara archive. Lee was also behind one of the first Guyanese movies entitled “If Wishes Were Horses” featuring comedian Habeeb Khan. Both GEMS and Ace Records managed to record original material by legendary calypso artists Lord Melody and Mighty Sparrow. Vivian Lee currently lives in Canada with his wife, Isabelle. If anybody knows of the whereabouts of Mr. Johnny Braff then please get in touch! It was good remembering Mr. Lee and Johnny Braff and all things mentioned in this article. While the date stasted at the top of the article, it is obvious that this is not the interview date. I would like to be able to put a reliable timeline to the actual interview date of the article. Johnny Braff lives in Brooklin, NY, as of a few years ago. If I am pressed I may even be able to provide an actual contact. The Interview was finished late 2011 and uploaded shortly after. I hope that answers your request. If you can put me in touch with Mr. Braff that would be much appreciated.